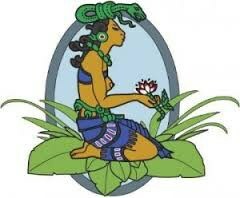 Ix Chel is the Mayan Snake Goddess of the Water. 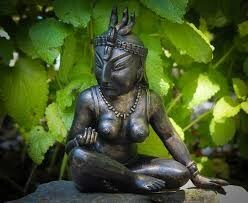 She is the Goddess of the moon, childbirth and weaving. She is also a Fertility Goddess, who brings the rain to feed the crops and who insured fertility by overturning her sacred urn. She is the weaver of the circle of life. 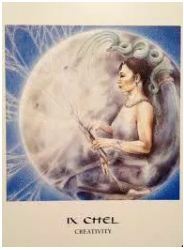 She is the Goddess of the Moon and healing, overseeing the medicinal plants and herbs, healing and the phases of the moon. Ix Chel has been described as beautiful, with long flowing hair. All who saw her, wanted her, but she had eyes on for Kinich Ahau, the Sun. As she followed him as he glided across the sky, she was unaware that she was causes havoc, as her inattention caused water in the form of floods to destroy the fields and crops. Finally, she took the Sun as a lover, but her grandfather, for whatever reason, became jealous and threw lightning and killed her. She lay dead for 183 days as dragonflies sang about her until she returned to life. She also returned to the Sun, whereupon it was his turn to be jealous and accuse her of cheating with his brother, the Morning Star. When the Sun threw her from the sky, she sought and received sanctuary from the Vulture God. The Sun, being unhappy with this arrangement, came and begged her to come back. She did, only to be faced once again with the Sun’s jealously. Ix Chel, tired of this childish behavior, left and wandered the night, doing as she wanted. Whenever the Sun would come near, she would make herself invisible so as not be seen. Ix Chel is depicted in all three aspects of the Goddess – Maiden, Mother & Crone. As Maiden, she is the beautiful, young lover of the Sun. As Mother, she is the Fertility Goddess caring for all women who are pregnant and in labor and is seen as sitting in a crescent moon, holding a rabbit. As Crone, she is seen as sitting with a serpent upon her head, wearing a skirt and crossbones, holding an urn in her hands, with represents the gift of water. The snake on her head is relative to her association with healing and intuition. 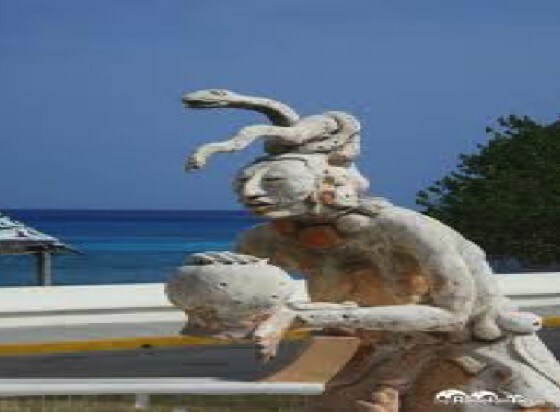 Cozumel and the Isla Mujeres, (Island of Women) are devoted to her worship.